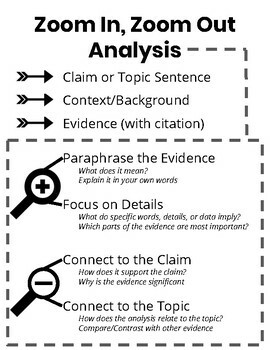 This graphic organizer and writing outline guides students through deeper analysis by asking them to zoom in on evidence and then zoom out to connect to their claim or topic sentence. Each step of the zoom in, zoom out process is accompanied by questions to guide analysis. This would make a great anchor chart, laminated resource, or general writing support.